Estella's Revenge: Mini Bloggiesta is HERE! On the personal side, I need to do a wee bit of maintenance here. I've been working on it progressively through the weeks of summer, but I have a few reviews I need to link up on my sidebar and I need to update my reviews database (not public yet). I'll probably also try to take part in the #Bloggiesta Twitter chat happening at 10pm US Eastern. 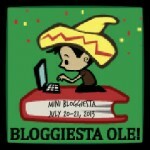 What are you undertaking for Bloggiesta?